In the aftermath of the horrific event, Ipinowula “Ipi” Adedokun created World Apparel Co. to sell fashionable clothing and donate a portion of its profits to help children in need. UNT finance student Ipinowula “Ipi” Adedokun (right) founded World Apparel Co., a nonprofit that aids children by using proceeds from clothing purchases. 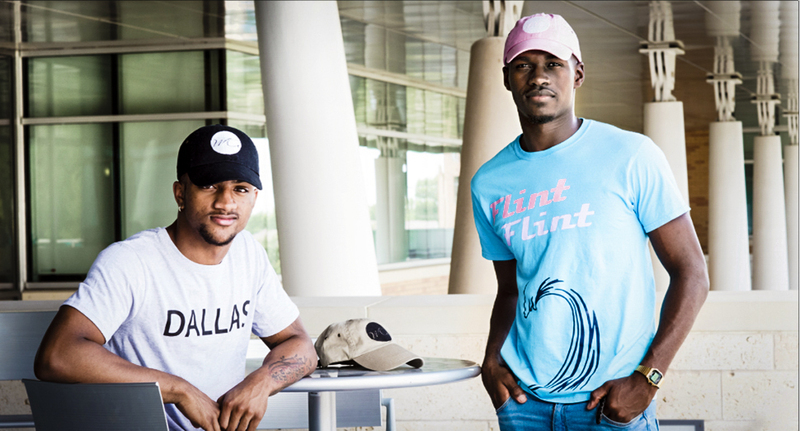 Adedokun and fellow UNT student Roderick Coleman (left), a volunteer with the group, are pictured with wearing the organization’s apparel. Photo: Ahna Hubnik/UNT. Like many others, Ipinowula “Ipi” Adedokun was devastated to learn about the deaths of five police officers on July 7, 2016 in downtown Dallas. But last year’s police ambush inspired the University of North Texas student to do his part to help others in need. “It was a sad thing that happened, but out of it came a phoenix from the ashes that turned something so grave into something so beautiful, and that’s World Apparel,” Adedokun said. In the aftermath of the horrific ambush, Adedokun created World Apparel Co., to sell fashionable clothing and donate a portion of its profits to help children in need. This month, World Apparel Co. was designated a domestic nonprofit corporation, according to university. Adedokun initially wanted to help the Dallas victims’ families directly, but was unable to come into contact with them. Originally from Nigeria, he saw an even greater purpose of creating a nonprofit to help underprivileged children even outside of Dallas. “I want to be the light to help those kids because they are the future,” Adedokun said. After the ambush, Adedokun began saving about half of his pay check, ranging from $2,000 to $3,000 a month, to develop his brand. By selling graphic T-shirts as part of the nonprofit’s “Dallas Tour,” he was able to raise enough money to donate more than 100 toys and a check for $200 to Promise House in Oak Cliff this past January in memory of the fallen officers. World Apparel is now focusing its efforts in Flint, Michigan, donating specialized water filters to filter lead from home water supplies. Adedokun and his team of volunteers will be traveling there at the end of the month to deliver the filters. Adedokun is planning future tours in Washington D.C. and Houston in an effort to bring awareness and help families who have been affected by child trafficking. The nonprofit is looking for investors and sponsors to grow its mission on a global scale. Adedokun is also looking to local help, as well as celebrities such as Chance the Rapper, Big Sean, and Deion Sanders. “They’re already making a change and I feel like if we can implement World Apparel with their movement, we can get, not only older generations but I want to get my generation to give and to invest their future,” Adedokun said. By expanding worldwide, Adedokun hopes to reach as many children as he can who are struggling with basic needs.